I've got quite the obsession with matcha, I probably use it at least once a day whether that's to make a matcha latte, a smoothie or even in porridge I'm not fussy! I love the taste and the health benefits of this super-green powder are undeniably amazing too, it's got everything from cancer-fighting properties to metabolism boosting powers. 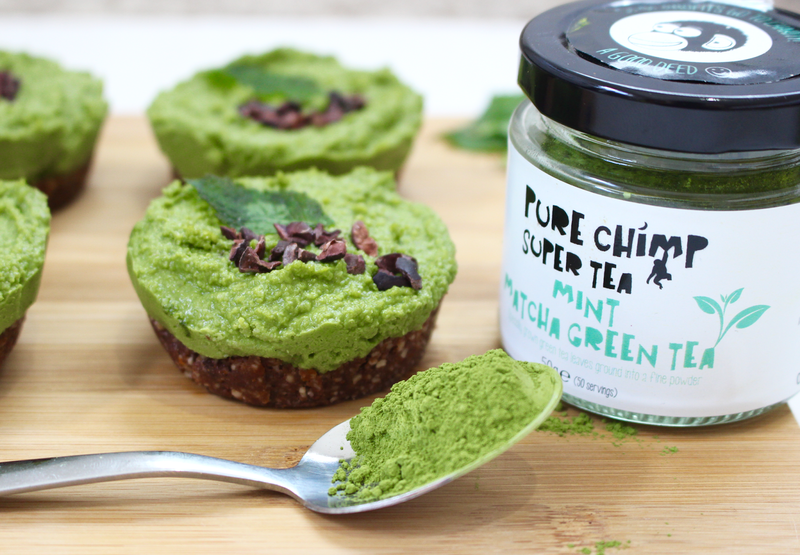 Pure Chimp Matcha Powders are delicious and so versatile too, so I thought I'd share with you my favourite recipe using their Mint Matcha Green Tea Powder. 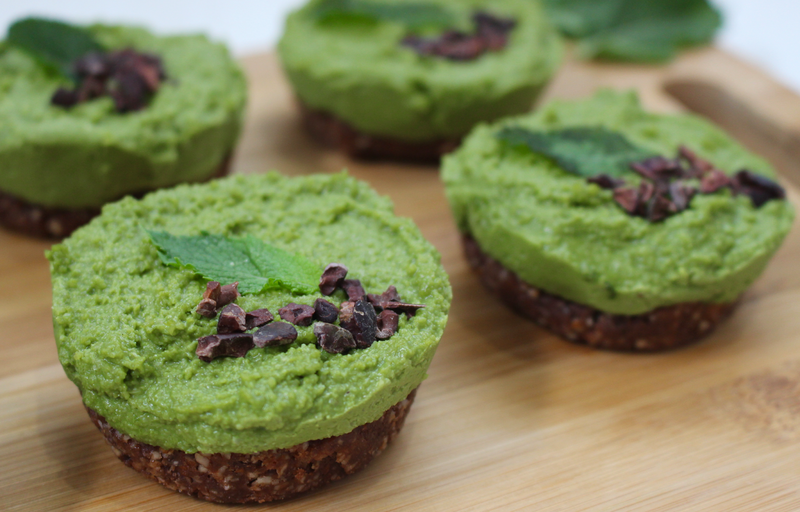 These vegan, gluten free, refined sugar free cheesecake bites are a total dream! Yes, they taste as delicious as they sound and they're loaded with amazing, nourishing goodness too so you can enjoy an indulgent dessert whilst knowing you're putting only good-for-you ingredients into your precious body. The base of these cheesecakes is made from almonds, medjool dates and coconut oil for a hit of healthy fats to make your skin glow and your hair shine, lower cholesterol and reduce your risk of heart disease, vitamin E to protect your cells, magnesium for vital enzyme function and a protein hit too! The medjool dates add an amazing gooey sweetness that'll satisfy even the biggest sweet-tooth without causing a nasty blood-sugar spike. The wonderful cheesecake filling is made using soaked cashews which blend into the most incredible creamy, smooth consistency when combined with coconut oil and a little almond milk. 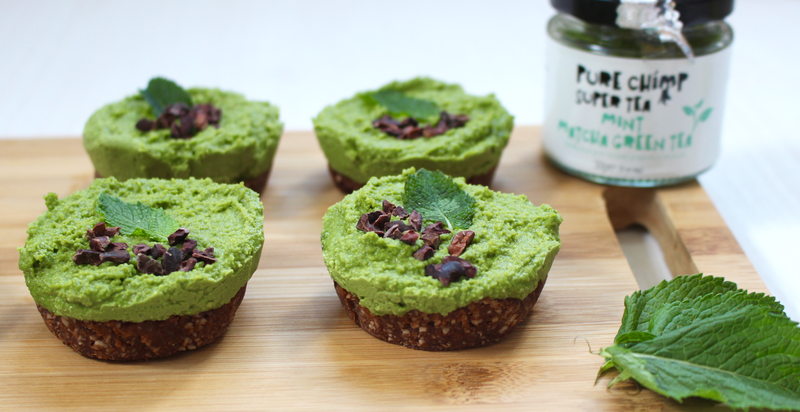 The Pure Chimp Mint Matcha Powder gives the cheesecake filling a luscious and flavoursome taste that compliments the nutty, sweet, chocolate base perfectly. The matcha powder will boost your energy levels, boost your mood and promote a healthy immune-system while the scrumptious mint is truly stomach-settling and is great for promoting healthy digestion. 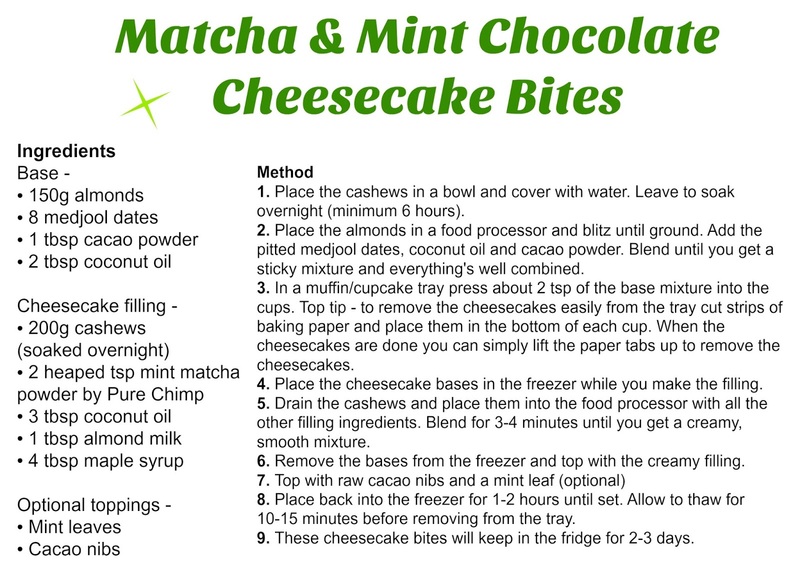 Buy your Mint Matcha powder here and get on with making these cheesecake bites for the perfect dessert!